On Bank Holiday Monday Amelia took part in the British Triathlon U20’s Festival 2017 at Mallory Park. 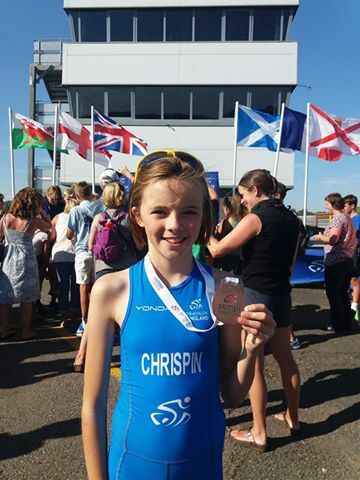 She had qualified to race for the Yorkshire Regional Team and was competing against 36 of the best selected athletes from 12 other regions across Great Britain, including Scotland and Wales. The race started just after lunch it was a very hot 26 degrees! Amelia was pulled back by both ankles in the swim which had hindered her progress and she came out of the water, off the pace, in 15th place. She did not panic and had a strong bike, moving through the field, and started the run in 5th position. The run , at only 1200m, was a lot shorter than the usual 1800m so Amelia really had to push to try and catch the athletes in front of her. As she came round to the last 200m she had managed to move up to a clear 3rd and was chasing the 2nd place athlete hard. She was constantly gaining on 2nd and crossed the line in a brilliant 3rd position, just 1 second behind the 2nd place. Amelia was ecstatic to be shortly afterwards presented with her Great Britain Tristar 2 Bronze medal!